C Rana, M Das, Z Altheeb, F Shamoon. Incidental Finding of an Isolated Persistent Left-Sided Superior Vena Cava During Central Venous Catheter Placement: A Case Report and Review. The Internet Journal of Cardiology. 2016 Volume 12 Number 1. Majority of persistent left superior vena cava (PLSVC) are asymptomatic and discovered incidentally. In this case report, we present a patient with bacteremia, osteomyelitis involving the lumbar spine, and infective endocarditis of the anterior/posterior leaflets of the mitral valve with moderate regurgitation who eventually underwent emergent mitral valve replacement. Prior to the surgery, Peripherally Inserted Central Catheter (PICC) and Triple-Lumen Central Venous Catheter were placed via left brachial vein and right internal jugular vein approach, respectively. Incidental PLSVC was identified on routine post-procedural radiograph as the catheters were seen in the left paramediastinal location. Interestingly, further analysis revealed that the PLSVC was not accompanied by a normal right-sided superior vena cava (SVC), which is a very rare variation of the venous system in the chest. A persistent left superior vena cava (PLSVC) is a rare finding. Majority of PSLVC are accompanied by a normal right sided SVC. In rare instances, PLSVC occurs in isolation and discovered incidentally during central line placement, echocardiography or pacemaker lead placement. There is a strong association between PLSVC are congenital heart diseases. 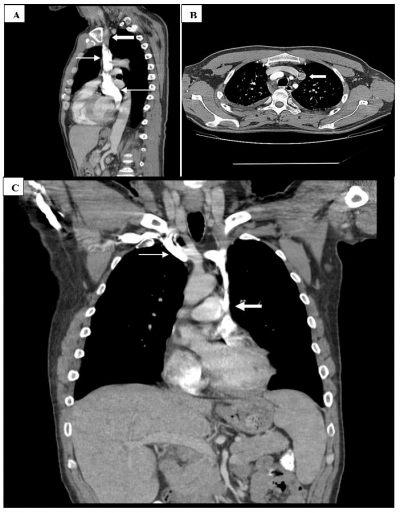 Although a rare finding, persistent left superior vena cava (PLSVC) is the most common anomaly of the thoracic venous system with a prevalence of 0.3 to 0.5% in the general population . It is the result of failure of regression of left anterior, common cardinal veins and left sinus horn during early development. In about 82% of cases, it is accompanied by a normal right sided SVC and the remaining occurs in isolation . Most of the cases are incidental findings during Computed Tomography (CT) scanning of the chest, during Central Venous Catheter (CVC) placement, or during pacemaker lead placement through the left internal jugular or subclavian venous routes. Occasionally, it can be diagnosed on plain films if a catheter is found in the left paramediastinal location. However, majority of the time it is missed on plain films due to the presence of co-existing normal right-sided SVC; though, it can be better visualized by CT scan with contrast. It is usually asymptomatic, except, in cases where a large right to left shunt exists. Here, we report a patient who underwent placement of central venous catheters via the right internal jugular vein and left brachial vein without any complications. 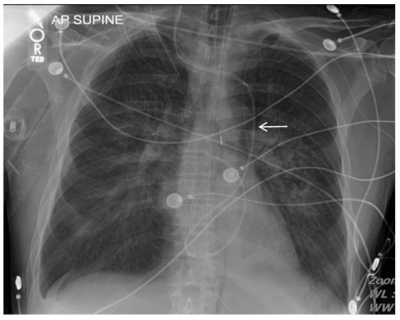 The catheters were found to be in its unusual location on the routine post-procedural chest radiograph. A 48 year old male with no significant past medical history presented with a 6 weeks history of localized back pain, fever, chills, night sweats and thirty pounds of unintentional weight loss. He also complained of progressively worsening neurological symptoms including decreased visual acuity in his right eye, paresthesia involving the 4th and 5th digits of his hands bilaterally which was accompanied by weakness. He was admitted to the hospital for further evaluation and was found to have Streptococcus anginosus bacteremia. MRI of the lumbar spine was suspicious for osteomyelitis involving L3 and L4. Additionally, MRI of the brain showed numerous bilateral ring enhancing lesions, raising suspicion for septic embolic and/or metastatic brain disease. He was started on Ceftriaxone and Gentamycin. Transesophageal Echocardiography (TEE) was performed as well, which was consistent with infective endocarditis of the anterior/posterior leaflets of the mitral valve with moderate mitral regurgitation. Patient was managed with antibiotics and discharge was planned with CVC insertion for extended-term intravenous antibiotics. During hospital stay, before being discharged, patient became hypotensive, hypoxic, tachycardic and had an episode of hemoptysis. CT angiography ruled out pulmonary embolism but indentified right upper lobe consolidation and presence of an isolated PLSVC (Figure 1). Patient was transferred to the Intensive Care Unit and intubated and started on mechanical ventilation for acute respiratory failure. Another CVC was placed for IV access in an attempt to obtain more ports for infusion and vasopressor administration. Routine post-intubation and post-CVC placement radiograph was suggestive of pulmonary edema involving both lungs. Further analysis of the radiograph showed the catheter in the left paramediastinal location, suggesting the presence of a left sided SVC (Figure 2). Computed tomography angiography showing isolated PLSVC (A) Saggital image the Left Internal Jugular Vein (thick white arrow) and extending inferiorly to form the PLSVC (thin white arrows). (B) Post Left Peripherally Inserted Central Catheter placement showing catheter in the left Superior Vena Cava, confirming presence of PLSVC. Extension from the Right Internal Jugular Vein towards the Left Superior Vena Cava as enhancement of the Peripherally Inserted Central Catheter line (thick white arrow) is seen. (C) Right Internal Jugular Vein (thin white arrow) tracking to the left side and combining with the Left Internal Jugular Vein to form the Left Superior Vena Cava (thick white arrow) confirming the presence of a PLSVC. Post-intubation and post-central venous catheter radiograph showing PLSVC. 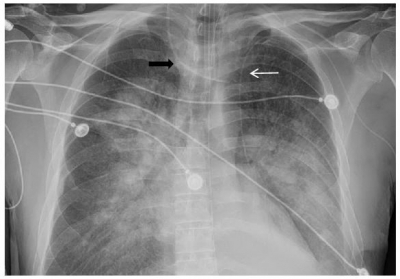 Post intubation and Central Venous Catheter placement radiograph showing Peripherally Inserted Central Catheter (white arrow) and Central Venous Catheter (thick black arrow) in the left paramediastinal location, suggesting presence of Persistent Left Superior Vena Cava. Subsequently, patient developed cardiogenic shock due to a rupture of the mitral valve papillary muscle causing pulmonary edema and a Swan-Ganz Catheter (Figure 3) was placed. Patient underwent emergent mitral valve replacement surgery. Post-operatively, patient started to improve clinically. Once he was stable, he was discharged home with instructions for a follow up of an MRI Brain. MRI of the brain was repeated in the outpatient setting which showed significant improvement of the previously identified ring enhancing lesions. Post-Swan-Ganz Catheter placement radiograph showing evidence of PLSVC. Post Swan-Ganz Catheter (thin white arrow) placement radiograph showing Catheter traversing across the mediastinum to the left then proceeding on an inferior path and subsequently returning upwards toward the Right Atrium. Although PLSVC is only seen in 0.3 to 0.5% of the normal population, its prevalence is as high as 10% in those with congenital heart disease. Studies have demonstrated that it is associated with the following congenital heart defects: atrial septal defect, ventricular septal defect, endocardial cushion defects, Tetralogy of Fallot, coarctation of the aorta, coronary sinus ostial atresia and Cor Triatriatum [1, 3, 6]. In this population, the presence of a PLSVC is associated with significant mortality and morbidity. The cardinal veins during embryogenesis are the source of implication for the formation of a PLSVC. The caudal portion of the right cardinal vein forms the right SVC but PLSVC is due to the persistence of the left anterior cardinal vein, which normally regresses to become the “ligament of Marshall” [7, 8, 9]. The right and persistent left SVCs are typically connected via the innominate vein, which may or may not be present. Rarely, the caudal portion of the right cardinal vein degenerates, obliterating the formation of the normal right SVC and blood from the cranial aspect of the body drains directly into the PLSVC . Majority of PLSVC are asymptomatic and are rarely detected due to presence of co-existing normal right SVC. Usually, they do not cause any hemodynamic compromise. About 92% of PLSVC drain into the right atrium via the coronary sinus; therefore, coronary sinus may be visualized as being dilated on imaging modalities. The remainder drains directly into the left atrium creating a right-to-left shunt . Nevertheless, it has minimal hemodynamic effect; although, rare cases of cyanosis have been reported in this population . During CVC placement, there is an increased risk of systemic embolization of air or thrombus in patients with PLSVC that drain directly in left atrium . Occurrence of PLSVC is often missed due to co-existence of a normal right-sided SVC. Historically, PLSVC were usually diagnosed during the placement of pacemakers or defibrillators when the cardiologist encountered difficulty with proper lead placement . Subsequent complications such as cardiogenic shock, arrhythmias, coronary sinus thrombosis, and cardiac tamponade are a concern; the incidence of this is quite low with the advent of new techniques and fluoroscopy . Nowadays, it is discovered at a greater frequency due to the advancement in imaging modalities. It can be seen incidentally on plain films if a catheter is found in left paramediastinal location or during transthoracic echocardiography when a dilated coronary sinus is recognized in the parasternal long axis view . It can also be diagnosed using CT with contrast, contrast ultrasonography, and using nuclear medicine. Although rare, an understanding of pathophysiology and variations of PLSVC is crucial for primary care providers. In the setting when a clinician notes resistance during insertion of a central venous catheter via the left jugular vein, possible existence of a PLSVC should be on the differential. Morgan LG, Gardner J, Calkins J.The incidental finding of a persistent left superior vena cava: implications for primary care providers-case and review. Case Reports in Medicine.2015; 2015:198754. Epub 2015 Jan 6. Kim H, Kim JH, Lee H. Persistent left superior vena cava: diagnosed by bedside echocardiography in a liver transplant patient: a case report. Korean Journal of Anesthesiology. 2014 Dec; 67(6):429-32. Epub 2014 Dec 29. Gibson F, Bodenham A. Misplaced central venous catheters: applied anatomy and practical management. British Journal of Anaesthesia. 2013 Mar; 110(3):333-46. Epub 2013 Feb 5. Higgs AG, Paris S, Potter F. Discovery of left-sided superior vena cava during central venous catheterization. British Journal of Anaesthesia. 1998; 81:260-1. R.B. Irwin, M. Greaves, M. Schmitt. Left superior vena cava: revisited. European Heart Journal Cardiovascular Imaging. 2012 April; 13(4): 284-91. Sarodia BD, Stoller JK: Persistent left superior vena cava: Case report and literature review. Respiratory Care 2000; 45:411–416. Gonzalez-Juanatey C et. al. Persistent left superior vena cava draining into the coronary sinus: report of 10 cases and literature review. Clinical Cardiology. 2004 Sep; 27(9):515-8. Goyal, Sandeep K et al. Persistent Left Superior Vena Cava: A Case Report and Review of Literature. Cardiovascular Ultrasound. 2008 October; 6:50.